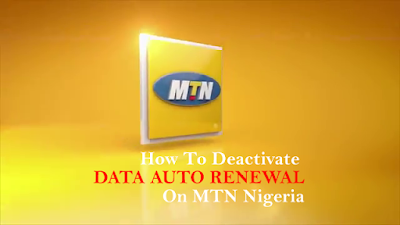 On the MTN Nigeria network, data auto renewal is always active, or better still, it is automatically activated once you buy a data plan with MTN. This feature is good, because it is a sure way to ensure that your unused data is rolled-over to the next subscription. In other words, there is no data wastage when data auto-renewal is on. But if for any reason you wish to deactivate data auto renewal on your line, then send NO to 131 as a text message. And data auto renewal will be deactivated line. But if you just want to deactivate auto renewal for only MTN data bundle, then text NO (followed by the data text subscription code) to 131. What we mean is this, let's suppose you do not want data auto renewal for the Day plan only but you still want auto renewal to be active for the weekly or monthly plans then text NO104 to 131. If you just text NO to 131, MTN will cancel auto renewal for all data plans on your line. But if you text NO(followed by a data plan code) to 131, MTN will only deactivate auto renewal for that data plan from your line. Remember: There should not be space between NO and the data plan code. Example, NO104 is correct, but NO 104 is not, and may not work.